Caretech takes great care of your loved ones — with integrity, honor and respectability. Our caregivers provide assistance with home activities and general daily help, and are matched with a caregiver according to schedule and duties. We strive to place a permanent caregiver to ensure familiarity of care. Of course, you’re welcome to interview caregivers before services begin. 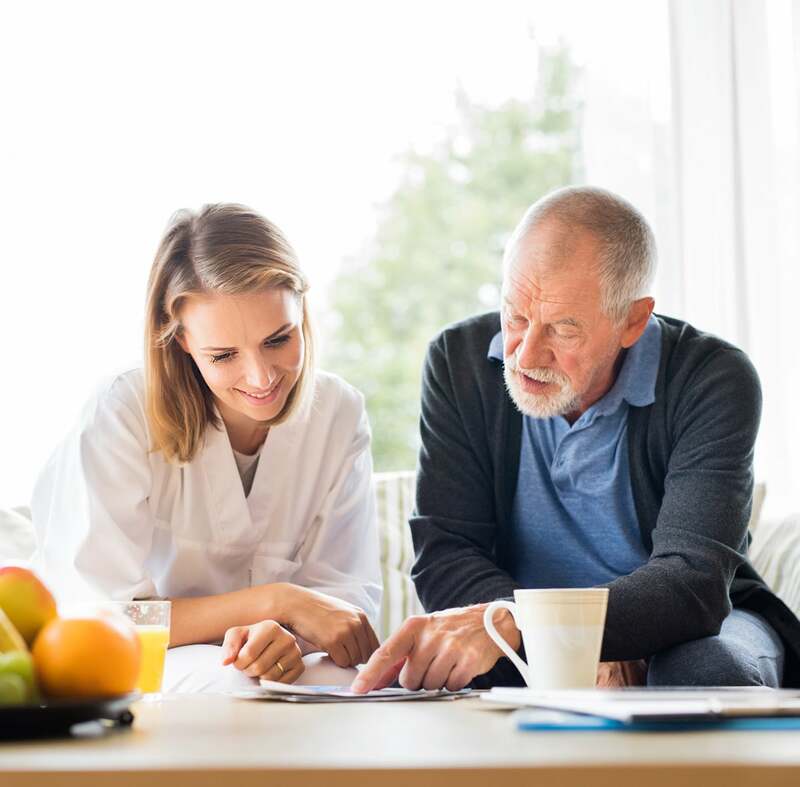 After you answer a few basic questions regarding the care you need, we’ll then arrange a meeting at the Caretech office or your loved one’s home to discuss further details and scheduling. Within one to two weeks — perhaps sooner — a Caretech caregiver will be assigned to assist your loved one. You’re welcome to interview caregivers before services begin. Rates vary depending on the services and hours needed. Once the rate is determined, you’ll only pay for the time worked. Please note that Caretech maintains a three-hour minimum per visit. To begin the assessment process, the client or representative can contact the office via phone, mail, fax, or email. When a person contacts the office, a manager will ask the following questions to determine the level of care needed: What type of assistance is needed? How many hours and what days would best meet the individual's needs (if you are unsure, we will be able to approximate the time required for each task)? What are the health and safety concerns of the individual (physical health, ailments, history of falling...)? Who is the contact person? A meeting can then be scheduled at the Caretech office or client's home to discuss further details and scheduling. Does the same caregiver come each time? In order to maintain familiarity and reliability, Caretech places caregivers on a consistent basis. It may be necessary in some cases to place two caregivers in order to accommodate the required schedule, but Caretech strives to place the same caregivers on a regular weekly schedule. How quickly can a caregiver be assigned? The average time for a caregiver assignment is one to two weeks depending on the days and hours needed. If the schedule is flexible, a caregiver may be assigned quicker based on the current caregivers' availability. If a caregiver is unable to make an appointment, Caretech will contact the client to determine if a replacement is requested. If so, we will do the best we can to find a replacement for the client until the original caregiver can return. Managers work closely with the family and client to assure all needs are met during the caregiver's absence. Is Caretech a maid service? Caretech is a care-giving service intended to help people remain in their homes. Our caregivers provide some homemaking and related work, as well as cooking and errands..., but our number one goal is to keep people happily independent in their own home for as long as it is safe and healthy. Our caregivers assist with those activities a client cannot complete without help. How much will services cost and is there a minimum charge? Please contact the Caretech office for specific hourly rates. Rates vary depending on the services and hours needed. Once the rate is determined, the client will only pay for the time worked. Caretech maintains a 3 hour minimum per visit. How do you keep track of the hours worked? Caregivers have an authorized number of hours per week or month, depending on the preference of the client and family. In addition, the caregiver will have a time report which is initialed or signed after each visit. Tasks are recorded each visit and if requested, a checklist of items to accomplish may be developed by the office based on needs. What background checks and insurance are provided? Caretech provides background checks for criminal histories, adult and child abuse/neglect, as well as state department of motor vehicles, sexual offender registry, Office of Inspector General, and Excluded Parties List Service. Caretech is bonded and insured for all services provided. Before accepting services from any agency, it is important to ask for a copy of the company's "Certificate of Insurance." This certificate will detail the coverages along with the insurance company's name. How and when am I billed for services? Billing is processed once a month and includes a calendar month of services. The invoice is mailed at the beginning of each month for the prior month of services.